Whether you prefer the hard to find and highly coveted wild ones, or the bigger, juicier cultivated ones, Blueberries are a tasty healthy treat that deserve more attention than they get. As a child, I can remember my Grandparents piling me in the car, suitably dressed in berry picking gear, and driving miles over heavily canopied dirt roads to their wild Blueberry patch. I was allowed to go only if I swore to keep the destination top secret. No problem there, I was too busy dreaming of all of the juicy, ripe fruit I would stuff into my mouth to pay any attention to where we were going. I regretted this later in life, when, after my Grandparents had passed away, Dad asked me where that patch of Blueberries of theirs was and I had no idea. Dad even drove me up and down the dirt roads in the area around where they lived in the hopes that something, anything, would jog my memory. It was not to be, we never could find that patch. Once we reached our destination we would climb out of the car, gather the pails, buckets, insect repellent and picnic basket. Grampa would grab his cane, Grandma would adjust her hat. Then we set off on a mile long journey through the woods. At my young age I could almost hear the bears chuffing their displeasure at our foray into their territory. I didn't dare stray from my Grandparents side. 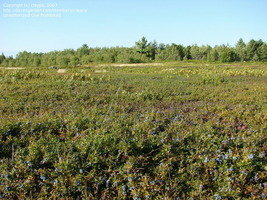 After what seemed like forever, we arrived at a nice sized clearing just blue with berries. Berries as far as the eye could see!! 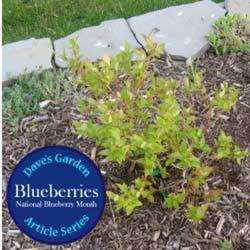 Native to only North America, the blueberry is a shrub. 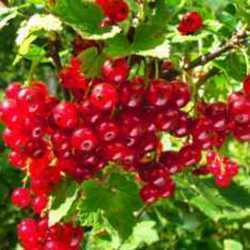 Lowbush or highbush refers to shrub size. The highbush, which is also the most common cultivated variety, are easier to pick standing up but the lowbush are more fun since you can park yourself comfortably right on the ground amongst them and pick as far as you can reach. Those were the ones we picked those summer days, my Grandparents and I. My "suitable attire" consisted of my oldest, torn pants and shirt, a bug hat and shoes. Everything on me would inevitably become stained a bright indigo. Be warned, Blueberry picking can become messy. The peak of Blueberry season is in July, so be sure to take along lots of bug spray. Blueberries are classed as one of the "super fruits". They have in their makeup the needed ingredients to help reduce the risks of diseases, including some cancers. 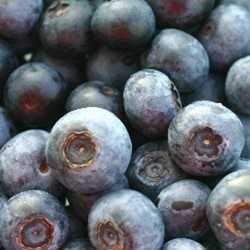 Research is showing Blueberries may reduce cholesterol, help prevent urinary tract infections. These are one healthy berry!!. Blueberries are also a very tasty berry. Grandma would use them fresh, or frozen, in muffins, pies, jams, jellies and my personal favourite, the Blueberry pancake. Dripping with real Maple Syrup, butter and maybe even a scoop of ice cream...sigh...ok, maybe not so healthy, but definitely yummy!! Toss a handful on your cereal in the morning, on yoghurt, even a bowl of berries with cream. 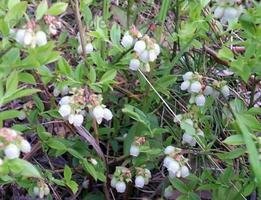 My Grandparents left me with many Blueberry memories, and although their prized wild Blueberry patch was lost to us, Dad and I always stopped along the highway at one of the many Blueberry stands and bought a basket to nibble in the truck, each of us quietly nibbling away, lost in our own memories. My thanks go out to claypa, Farmerdill and poppysue for their wonderful photos..